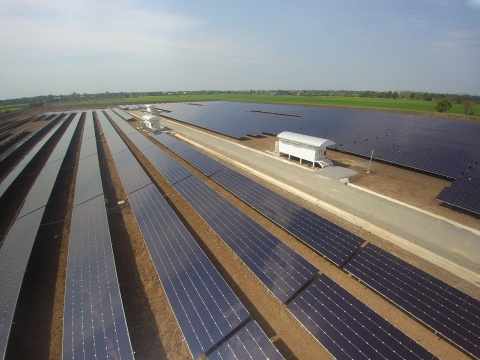 The Sena 1 solar installation is one of four solar farms included in a group of power generation assets completed across the Ayutthaya and Pathum Thani provinces in Thailand by Prime Road Group. First Solar, Inc. supplied 18MW of thin film PV modules for the projects. Prime Road Group and First Solar, Inc. welcome the completion of four solar farms totaling 18 megawatts (MWDC) of capacity in Thailand. Located across the Ayutthaya and Pathum Thani Provinces, the Prime Road Group Co-Op Project (Project) utilizes more than 158,500 First Solar thin-film photovoltaic (PV) modules to produce approximately 29,600 megawatt-hours (MWh) of clean electricity in the first year of operation. Developed under Thailand’s Governmental Agency and Agricultural Cooperatives Program, the completion marks an important milestone for the country as it continues to grow its installed solar PV capacity and target 30 per cent renewable energy by 2036. Thailand-based developer Prime Road Group has partnered with First Solar as the module supplier and Bouygues-Thai Ltd – a subsidiary of the French Bouygues Group – as the Engineering, Procurement and Construction contractor for the delivery of the Project. The Project will produce enough clean solar energy each year to power 12,000 homes in Thailand and displace approximately 14,000 metric tons of carbon dioxide annually. The First Solar Series 4 thin-film PV modules deployed at the four sites are ideally suited to the local environmental conditions in Southeast Asia, due to their superior temperature coefficient, better shading response, and better spectral response. This performance advantage allows for optimal performance and over the course of the Project’s operational life will translate into significant gains in power output. “Bouygues-Thai is very proud to have contributed to this project, committing to a higher level of performance to the Prime Road Group project thanks to the technical advantage of the thin-film modules developed by First Solar,” said Patrice Bard, Managing Director of Bouygues-Thai Ltd. The electricity from the Prime Road Group Co-Op Project will be sold via a 25-year Power Purchase Agreement with the Provincial Electricity Authority of Thailand at a rate of THB 5.66 per kilowatt hour. About Prime Road Group Co., Ltd.
Prime Road Group (PRG) is a leading investment group based in Thailand, with diversified interests in Renewable Energy, Real Estate and Waste Management, and a regional focus in the Asia-Pacific. In its Renewable Energy business, it develops, owns and operates projects in Thailand and Japan, with a portfolio of over 100MW of Solar PV in operation and a significant pipeline in development. It aims to expand its presence across SE Asia and other emerging markets by tapping into the growing demand for renewable energy in the region.